Tomoteru “Tomo” Saito was born and raised in Osaka, Japan and now lives and works in Florence, Italy. He studied at the Designer’s School in Osaka and worked as an architect in Tokyo before moving to Italy where he is now a “Madonnaro,” or street painter. 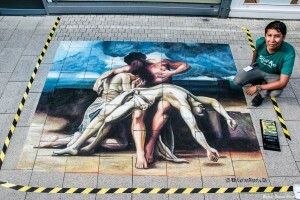 Besides classical 2-D street painting, he also creates anamorphic 3-D street painting. 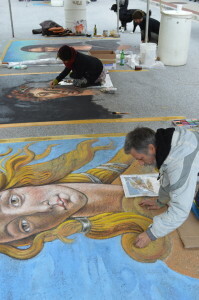 He holds some of the most prestigious awards in street painting, most notably from the Grazie di Curtatone Madonnari Competition in Mantova, Italy, where he was awarded 1st place among “Maestri Madonnari” in 2000 and 2001. 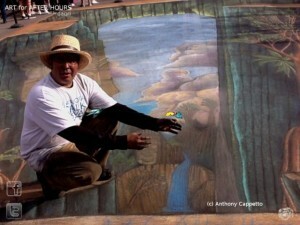 He participates in street painting festivals throughout Europe, the U.S., Mexico, Hong Kong, Dubai and more. 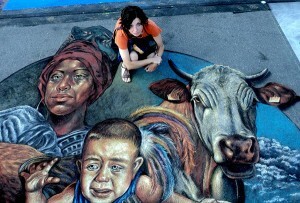 Vera Bugatti (1979) is an Italian Artist and Street painter. She got a Liberal-Arts degree and she researched on XVI century editions so in everyday life she is a Librarian too. She took part in various exhibitions and she performed in several Street Art events all over the world winning awards in Italy, The Netherlands, France, Germany, Ireland, Croatia, Austria, Malta, Sweden, Denmark, Bosnia & Herzegovina, Russia, Latvia, Portogallo, USA and Mexico. 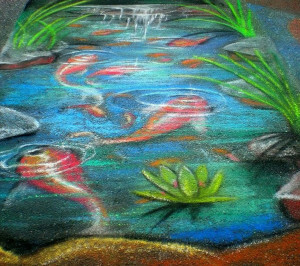 Her chalk work is also featured in the books: ‘Sidewalk Canvas’ by Julie Kirk Purcell – London 2011; ‘Street Art’ by Russ Thorne’ – London 2014 and The Art of Chalk by Tracy Lee Stum – USA 2016. 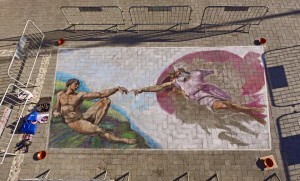 Vera was one of the 13 international artists chosen to collaborate with master Kurt Wenner at Sarasota Chalk Festival (USA 2012) to create a large 3D masterpiece. 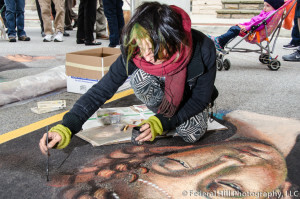 Since she considers street-painting as a part of her artistic path she tried to find every time new subjects and more different suggestions to have a dialogue with, working with several techniques, ranging from chalk and paints to wire, electric elements and nails. 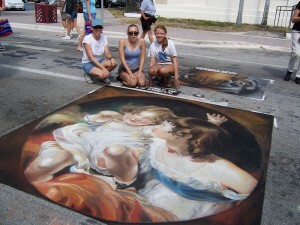 Jennifer Chaparro is an internationally recognized award-winning street painter/madonnara from South Florida. She grew up in San Diego and has a degree in Design from UCLA. Her daughter, Mercedes Chaparro, has a degree in Architecture from Carnegie Mellon University in Pittsburgh and now lives and works in the Washington DC area. 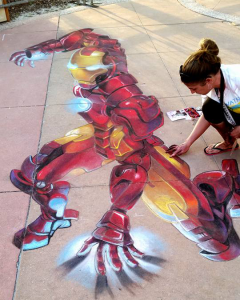 Jennifer began street painting in 2004 as something fun to do with her daughter, but then turned it into a business and now travels the world creating custom works of art for festivals and special events. 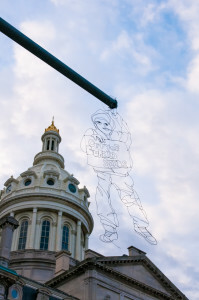 Jennifer received her Maestro Certification in 2011, and is known for her exquisite portraiture, but also for exciting 3D anamorphic street art that boggles the mind. You can see more of her work on her website at www.AmazingStreetPainting.com. Carlos Alberto GH is an artist from Guadalajara, Mexico who was introduced to street art by his sister, Adry del Rocío, with whom he frequently collaborates. 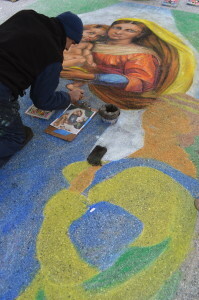 They have participated in international street painting and mural expositions all over the world including in the United States, Cuba, Sweden, Spain, the Netherlands, Germany, Russia and at home in Mexico. Carlos is a former archaeological restorer on the Mayan peninsula. Andrea Starinieri was born in 1977 in Pescara, Italy. 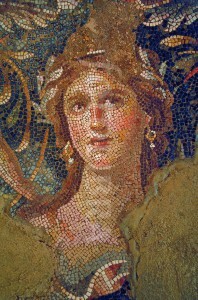 He graduated art school in his hometown before moving to Florence, Italy, to attend the Fine Art Academy. 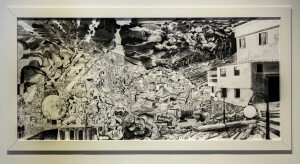 After receiving his degree in 2002, Andrea went on working in a number of art galleries in Florence and Granada, Spain. He actually lives in Pescara with his wife Lara and their two kids. 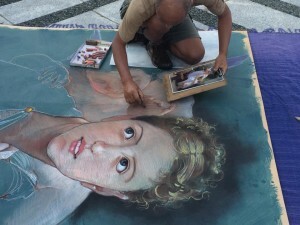 He works as a “Madonnaro” (pavement artist) mostly along Via del Corso in Rome. Wendy Stum attended her first street panting festival in the late 1990’s and started photographing, then video interviewing the artists at work as a way to share the art form with the public. Documenting these festivals eventually led to Blog Now, a street painting themed online journal which covers and promotes festivals and artists worldwide in addition to street painting TV, an online video channel. 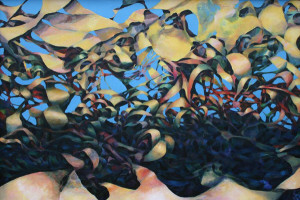 A native of Baltimore, Barbara Epstein Gruber attended Catonsville Community College, received a BFA in painting from the Maryland Institute College of Art, studied in the graduate fine arts program at the University of Pennsylvania and earned her MFA from Brooklyn College. Her work can be found in private and corporate collections throughout the US, Europe and the UK and has been featured in numerous local and national publications. 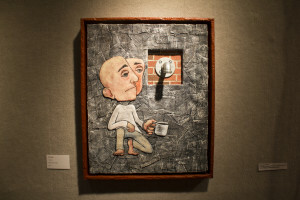 Ms. Gruber’s work has won Best in Show and Honorable Mention at national and regional levels by such esteemed jurors as Klauss Kertess of the Whitney Museum, Bernard Chaet, Samuel Hoi, George Gurney of the Smithsonian and Doreen Bolger of the BMA. She is currently an instructor at the Maryland Institute College of Art, The Johns Hopkins University and The Yellow Barn. 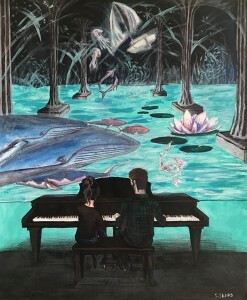 Most recently, she was a finalist for the William and Trafford Klots residency in Brittany, France. Ms. Gruber’s work has appeared in the New York Times Art Review, New American Paintings, The Baltimore Urbanite, and the covers of the Bluefield Daily Telegraph, The Huntington Arts Review and the Baltimore Messenger and been featured in videos for The Loudoun Times Mirror. Her work can be seen in private and corporate collections throughout the United States, Washington, D.C., Europe and the UK and she is represented in galleries in Maryland, New York, Massachusetts, California and Virginia. Ms. Gruber has been a guest juror for noted arts organizations and is frequently invited to participate in arts fundraisers. 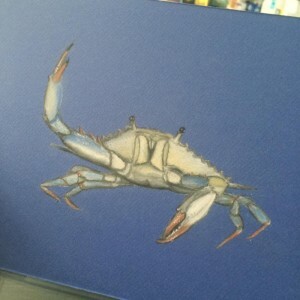 Barbara Gruber is currently an instructor at the Maryland Institute College of Art, and the Johns Hopkins University, The Yellow Barn and The Griffin Art Center. She has taught at Anne Arundel Community College, Stevenson University and Howard Community College. Peter Smith is a Baltimore-based artist plumbing the depths of color relationships and the unexpected moments discovered while capturing the human figure. 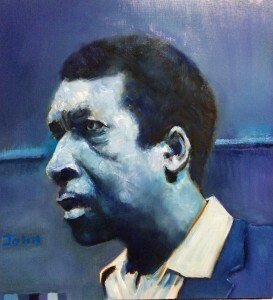 He entwines musicality within his own gesture, often depicting the musicians who boldly challenged academic instrumentation to establish a new American avant-garde: Jazz. 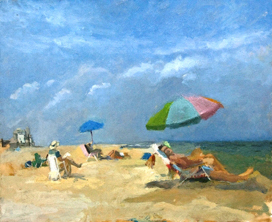 Smith studied with the prominent contemporary painter Mary Beth McKenzie at the Art Students League of New York, as well as various master artists in Baltimore. 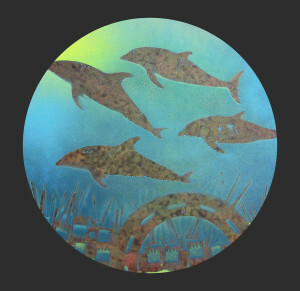 His work is in numerous private collections in Baltimore, MD. By day, Erik Greenawalt is a CPA (the boring debits and credits type) working in corporate finance for a large Pittsburgh-based grocery chain. 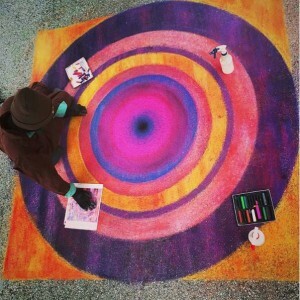 But on weekends, he puts on his other CPA hat – Chalk Professional Artist — and adds life to driveways, streets and sidewalks from New York to Florida. Erik’s interest in chalk art began about a decade ago when doodling in the driveway with his then-toddlers, Jaycie and Jenna. Crude stick figures began morphing into more-sophisticated Disney princesses and, last year, 3D renderings of Olaf and Emmet the Lego Man. He became known in the neighborhood as “The Chalking Dad” – and the name has stuck. He still takes most of his drawing orders from his daughters (who sometimes chalk alongside him at festivals), which results in fun, colorful pieces — and not just cartoons anymore. 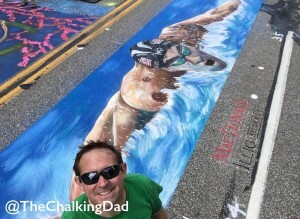 You can follow his work at instagram.com/TheChalkingDad. Christopher Kojzar received his B.A. in International Affairs and Economics from George Washington University in 2005 and studies Intermedia and Digital Arts at University of Maryland Baltimore County. In 2013, the Creative Alliance of Baltimore, MD selected Christopher to be one of eight residents for a highly competitive three-year program. He also joined television productions on Bravo, Netflix & HBO to work professionally as a propmaker. Christopher’s multidisciplinary practice encompasses drawing, video installation, publication, functional design, and group performance collaboration. 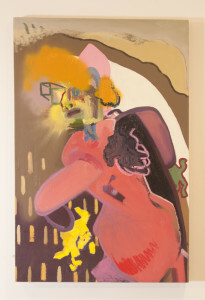 His visual work is highly representational with raw, sublime, and expressive qualities. He is the recipient of scholarships from the Haystack Mountain School of Crafts in Deer Isle, Maine, the Penland School of Arts and Crafts in Penland, North Carolina, and Common Ground on the Hill in Western Maryland. 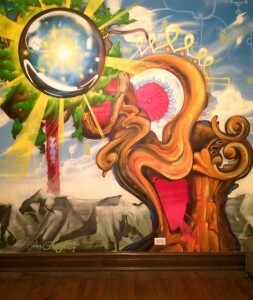 He has performed and exhibited in Honolulu, San Francisco, Washington DC, Baltimore, Marseille, France & Buenos Aires, Argentina while his visual art is found nationally and internationally. 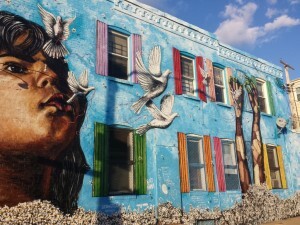 After extensive travel, Christopher chose his home base of Baltimore to delve into his studio practice. KC attended Shepherd University where she participated in college athletics and studied painting. In her senior year she joined the Navy where she was a Hospital Corpsman for four years. During this time KC’s creative exposure was elevated through world travel and exposure to new experiences. From bootcamp to her last day in the Navy she continuously contributed her skills to multiple projects and was responsible for numerous logo designs, t-shirt, poster and flyer graphics. 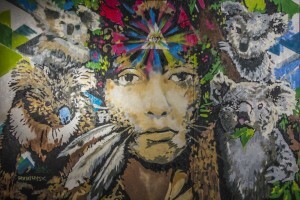 KC has exhibited in numerous galleries across the United States as well as abroad including The French Embassy Art Gallery in Saõ Tomé Africa, Walter Reed Wounded Warrior Memorial in Bethesda Maryland, Red Brick Gallery and Phaze 2 Gallery in West Virginia, The Grotto Cafe in Cave Creek Arizona and Spur Gallery in Baltimore, MD. She has done logo design for Stevenson University as well as store graphics for Lululemon. Her illustrative work and paintings depict visual narrations from her past military experience juxtaposed with contemporary culture depicted through parallel realities. She is motivated by daily visions and experiences. Using obscure line work, luminous color palettes, questionable lyric and/or sarcasm, she wants her viewers to feel the same temporary relinquishment from generic life. Her biggest influences are Jessica Hische, Mike Perry, Chipp Kidd and Mr. Bingo. 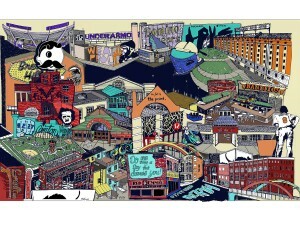 KC currently resides and works in Baltimore Maryland. 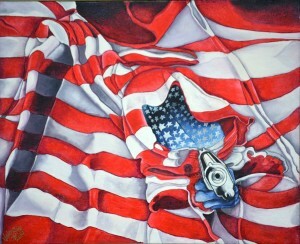 Bobby Coleman is a Baltimore-based painter. 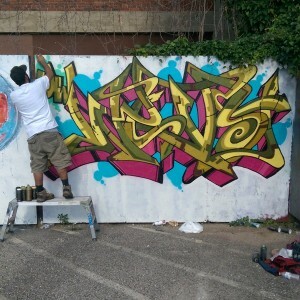 His large, abstract paintings deal with themes of graffiti, doodling, building, and mark manipulation. 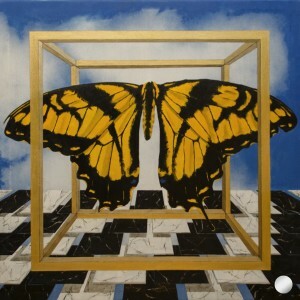 He received his BA in Studio Art from McDaniel College in Westminster, MD and his MFA in Painting and Studio Art from American University in Washington, D.C. His paintings have been exhibited in Maryland, D.C., Virginia, Michigan, California and Ohio. Sebastian Sears is a Baltimore-based artist focusing on themes of disassociation, technological sentience and the unlikeliness of being. 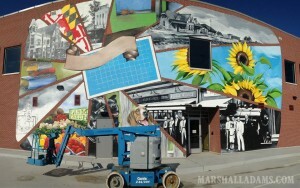 In addition to creating several murals, his artwork has also been exhibited at Maryland Art Place, the Creative Alliance and Gallery 788. Sears is also a frequent contributor to local theater productions. “Oaks may fall while reeds stand the storm” Reed Bmore (°1992, Manila, Philippines) is a street artist who works in the media of wire. 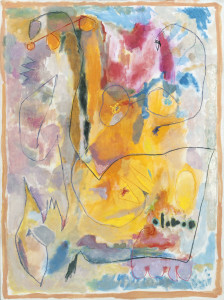 By demonstrating the omnipresent lingering of a systematic world, his artwork references childhood expression as well as avant-garde materiality. His artworks question the normal function and conditions of an image in our contemporary visual culture. By exploring the concept of landscape in a nostalgic way he generates diverse meanings. Associations and meanings collide. Space becomes a subjective experience, honed by the viewer. His works demonstrate how life extends beyond its own subjective limits and often tells a story about the effects of social and cultural interaction. Reed Bmore challenges the binaries we continually reconstruct between Self and Other, between our own ‘logical’ and ‘playful’ selves. By studying sign processes, signification, and communication, he investigates the dynamics of landscape, the manipulation of its effects and the limits of spectacle based on our own assumptions. Rather than presenting a factual reality, an illusion is fabricated to conjure the realms of our imagination. His works establish a link between the landscape’s reality and that imagined by its conceiver. These works focus on concrete questions that determine our existence. 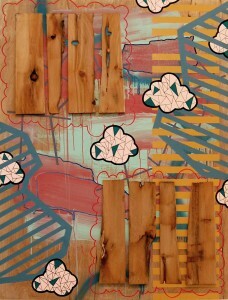 Reed Bmore currently lives and works in the city of Baltimore, Maryland. Combs his hair til it’s pretty. Ali Seradge paints and paints. He grew up watching Transformers and the Iran-Iraq war. He still watches idealizations of war and correspondence of actual war. He watches and watches and reads and reads. Patterns emerge as he watches, reads, and listens. He looks for stories old and new where heroes are not often heroic, villains show humanity, and gods punish people for being human. He attempts to repackage these myths for a modern era when nations are becoming porous, races mixed, and a tipping point for contemporary humanity is fast approaching. I, Valerie A. Smith, live and work in Baltimore, Maryland. I love to create colorful surrealistic artwork. 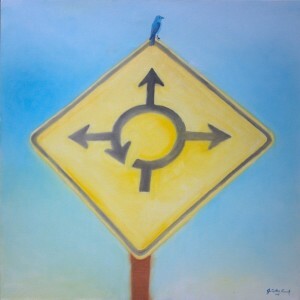 My preferences is to work with large pieces, however, I can demonstrate my detailed style on smaller canvases. 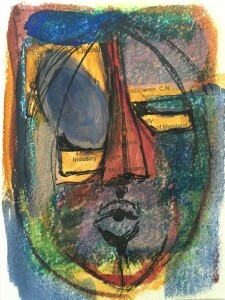 I enjoy working with inks, acrylics, watercolors, wood and mixed medium. I create a style of work that carries a message or tell a story. I don’t want the viewer to just see my work, I want them to think about the story it tells. Occasionally, I create subtle messages within my work and other times these messages are screaming loudly in bold eye catching colors. I begin my work by building the stretcher for the canvas, stretch the canvas, paint and when I am done, I build the frame for it. It’s like seeing my creations born, grow and mature; once my art is framed, I have told another story. I studied fine arts at MICA (Maryland Institute College of Art), Towson University and graduated from PICA (Professional Institute of Commercial Art). I studied Architectural Design and basic electronics, my varied education gives me an insight of how I want my work to look when completed. 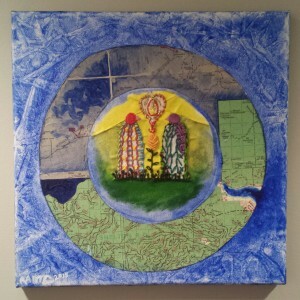 Holland Winslow is passionate about color and expresses this through her vibrant and deep hues in her artwork. 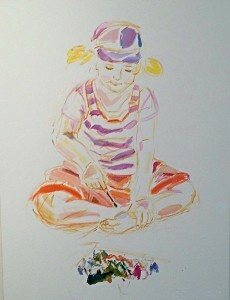 She graduated from East Carolina University with numerous art awards and scholarships along the way. 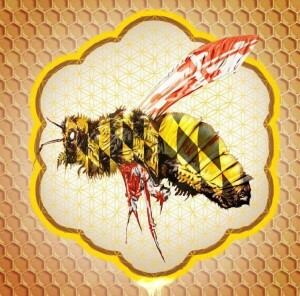 She lives in Williamsburg, VA where she is a full time graphic designer for the Commonwealth of VA and owns a small business “Hollandesigns,” which focuses in graphic design, streetpainting and murals. Holland started street painting in 2007. 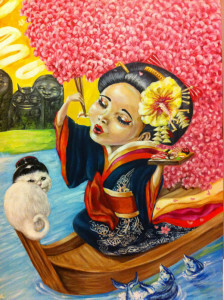 In 2008, she won Best in Show for her “Koi Fish” and many more awards have followed. Since then, she has “taken to the streets” with her chalking, traveling for competitions and commissions, working in both 3D and 2d installations. Through streetpainting, she has gained friends from all over the world and coming together at events is so rewarding and life is like a box of pastels! 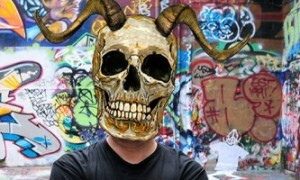 NEVS is a veteran New York graffiti writer who would rather remain anonymous for obvious reasons.